There is no doubt that there is a demand for greater IP bandwidth by both the consumer and commercial enterprise. The work place across all vertical markets has become more dependent on electronic communication. The work place relies on e-mail, VoIP phones, file storage and sharing, application delivery, collaboration, reporting, IP Video, Access Control, etc. Everywhere we turn we see the consumer using the internet for entertainment, personal interaction, managing their finances, content delivery, etc. So how are we going to deliver all the necessary bandwidth and provide internet connectivity to all areas of the country? Ask a government official or the lobbyist of the large telecommunication providers and they'll say run fiber everywhere. Sounds great but when reality hits the notion of fiber everywhere is as mythical as a unicorn. Technically can it be done? Yes if you can wait several decades and have trillions of dollars to spend and don't mind replacing it all because by the time it's all deployed it's obsolete or needs to be replaced due to deterioration. As the USA spends millions lobbying for a fiber build out and billions more slowly deploying a fiber backhaul infrastructure the rest of the world is leap frogging us by skipping over a fiber infrastructure by rapidly deploying wireless backhaul using microwave communications and technologies like WiMax backhaul and LTE. They are getting bandwidth in even the most remote places in the matter of months and have done so at a fraction of the cost. They also benefit from having scalable infrastructure protecting the overall CAPEX and future growth. Here is an example: Out in a rural area if you needed to run fiber 5 miles it could take over a year and a million dollars to do so. You would need to first gain right away access to run the fiber cabling, get permits from potential multiple entities, set up long term land use agreements, install poles every 100ft in order to string the fiber along (which is cheaper than trying to trench the ground five miles to lay conduit), run the fiber and fusion splice it along the way, install expensive head end equipment on both ends, and then figure out how to spread it out from there. I guess you run even more fiber? Name a carrier that is willing to spend millions to get fiber out to a small community where it would take decades for them to get an ROI. Wireless backhaul using microwave communications in the same scenario can be deployed in days and cost less than $100K. With a point to point wireless backhaul you do not have the need to get right away access, need permits beyond the two end points, have any need for costly infrastructure along the path, or have expensive head end equipment. From the end point you can easily spur off wireless connectivity to other locations using point to multipoint wireless Ethernet bridges, point to point wireless backhaul, WiMax backhaul, or wireless mesh. This can be done in days not years and at a fraction of the cost of fiber. The argument comes up that fiber delivers greater bandwidth. Not true. Wireless backhaul can use licensed microwave links delivering better than gigabit wireless communication and if more bandwidth is needed it's quick and simple to add more microwave links. What about reliability? Let me ask you. What happens when a wood pole holding aerial fiber get hit by a car or knocked down in a storm. Don't laugh it happens more than you think. Even fiber in underground conduits gets destroyed. 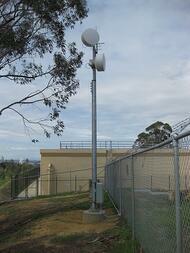 See my article "Outdoor Wireless Bridges or Fiber, Which Do You Trust." If it's a clean break fiber can be fusion spliced back together. In most cases where a fiber pole goes down or gets ripped out by a backhoe, the fiber gets stretch and has to be replace but cutting it at two ends and a new piece fusion spliced back in. This can take hours if not days to accomplish. If a microwave radio fails it can be swapped out in the matter of hours. A fixed wireless microwave link can go distances up to 50+ miles and provide data rates of 10Mbps full duplex to GigE Full Duplex (gigabit wireless). With proper wireless system design, a fixed wireless Ethernet bridge can provide 99.999% reliability. Wireless Ethernet bridges can be installed at a lowered throughput and later software upgraded to higher bandwidth when needed allowing for a lower wireless installation and protecting the CAPEX for future growth. In order to get broadband across America at any reasonable time frame and at realistic costs we must turn to wireless broadband technology. The biggest hold up is the FCC opening up more spectrum for wireless backhaul.